The following is an edited excerpt from Listen Or Die by Sean McDade, PhD. The true “voice” of your customer is the unique words they share with you each time you ask them “Why” or “Please tell me more about that” in your survey. There is gold in each comment that customers share with you. The question is this: how do you best mine for that gold? Enter text analytics. No matter how you are listening to customers, the data you will ultimately collect will be one of two types: structured or unstructured. When customers provide their answer to this question, it comes in the form of a number. In this case, a 5 would indicate very satisfied with the most recent visit to the hotel, a 1 would indicate very dissatisfied, and so on. Almost any VoC software platform can easily analyze these data and create graphs to aggregate and compare the responses: Maybe 30% of respondents were very satisfied, 35% very dissatisfied, and so forth. Unlike structured data, which are easy to display graphically or in tables, each piece of unstructured data is different—unique to each customer who took the time to provide it. This unstructured customer feedback is key to understanding why satisfaction levels are what they are, but is much more difficult to understand at scale. How do we make sense out of unstructured comments from customers? There are two options: humans or machines. Humans are the most expensive method to make sense of unstructured comments—often prohibitively so, because not only are they expensive knowledge workers, but the effort also doesn’t scale. A person is tasked with reviewing a small sample (one hundred is common) of open-ended customer comments and the goal is to identify major “themes” from these comments. They create what is called a “codebook” that contains a handful of major themes (usually five to ten). Then usually another person reviews the remainder of the open ends, one by one, and assigns one of the major themes to each comment. We are talking about thousands of comments, which in some circumstances means days or weeks of work. The end result is that unstructured comments become structured! Market researchers then create a report that quantifies these comments—such as 43% of people mentioned Wi-Fi as a problem, 16% mentioned the spa as an issue, and so on. The human approach is virtually impossible to scale. 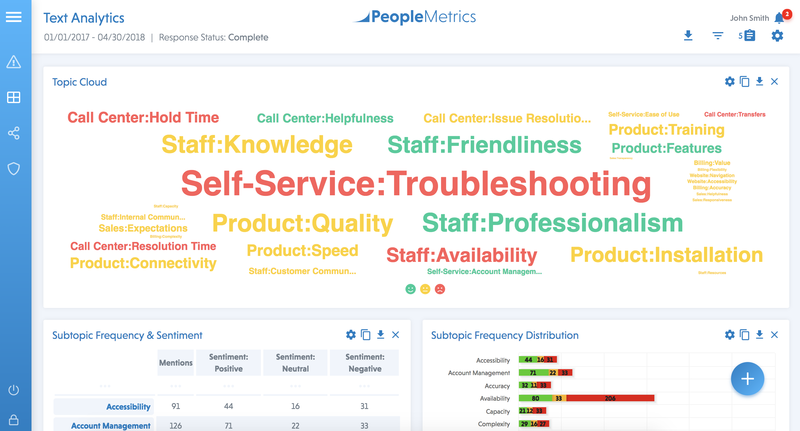 For PeopleMetrics’ larger clients, we send out more than 20,000 surveys a week, which results in thousands of open-ended responses. In a given day, even the best human coders might only be able to handle a few hundred comments. Machines, on the other hand, can scale infinitely. Next, the machine is trained to understand customer sentiment for each comment. One customer might say, “I love this hotel because the wifi is so fast.” Another customer’s comment could be, “wifi, there was nothing fast about it, so frustrating.” The machine then assigns a sentiment score for each comment related to given topics, usually ranging from –1 to +1. Human coders can’t even begin to compete with text analytics in speed and cost. Although it costs more up front to set up text analytics—maybe $10,000 to $20,000—the cost per comment when it’s up and running is minimal. Costs will not continue to build with volume, while you might pay humans a dollar or two per comment indefinitely. 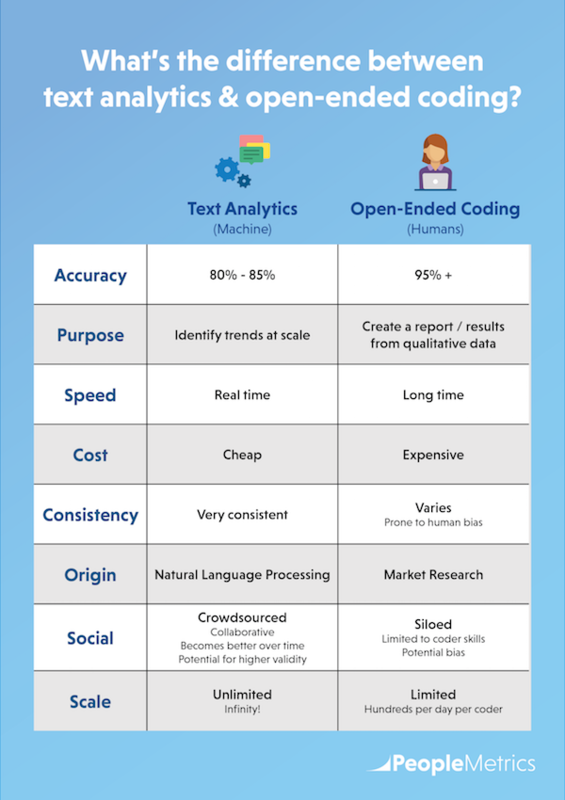 While text analytics can’t match the accuracy of human coders (at least right now)— as high as 95% accurate for humans, compared with 80% to 85% for text analytics—with volume and time, text analytics learn. When people spot contradictions and correct them, they are training the machine to do better the next time. Human coders, on the other hand, are more likely to become less accurate with higher volume and time, skimming long comments for words they’re used to seeing instead of looking for anything new. In contrast, the machine, which neither bores nor tires, can identify both familiar words and emerging outliers. If you’re still concerned about the difference in accuracy between open-ended coding and text analytics, let it go! Consider the trade-off between greater accuracy on every comment and the ability to spot key trends in real time that will help you improve CX. If you don’t have a quick, accurate, and affordable way to process your unstructured customer feedback, collecting it in the first place is a pointless exercise. Text analytics represents the present and future. Without it, you are not getting all you can out of your VoC program. Response rates are dropping for longer surveys, and you need to get more out of fewer open-ended questions. Plus, with the continuing growth of social media, you can expect to receive more unstructured feedback in the form of social reviews. This is why I’m saying that text analytics is not a feature of VoC; it is VoC. It’s the only way you can stay on top of key trends in a cost-efficient manner at scale. This is an edited excerpt from Listen Or Die by Sean McDade, PhD.